We’ve got some incredibly hot specials during the month of July. Dysport is only $6 per unit. You can also get $100 off your Juvederm treatment when you schedule it by July 31. Have you been thinking of breast augmentation? During July you can get $500 off the procedure, 50 free units of Botox for you AND 50 free units of Botox for a friend! It doesn’t get any better than that! If you’re out and about Friday, July 10, stop by Dillards and visit me there between 3 – 7 p.m. You’ll get 20% off Botox when you do. Check out the details on the flyer, then make the call today! 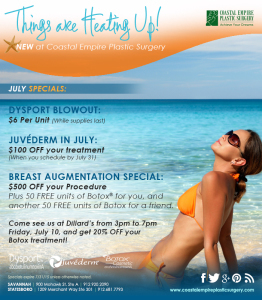 Contact Coastal Empire Plastic Surgery at (912) 920-2090 in Savannah or (912) 681-7793 in Statesboro.